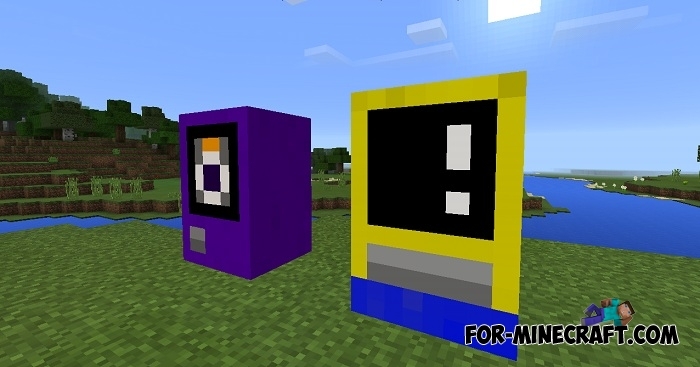 This is one of the first addons that adds currency and vending machines for the sale of items. It is very difficult to develop addons, because they are not intended for global game changes and can only replace one object with another. But despite this, some players come up with interesting additions that bring into the game something unique and distinctive. Mine-Machine is just one of the unusual modifications that adds 14 special machines and currency for exchange. How to get a machine and how to use it? 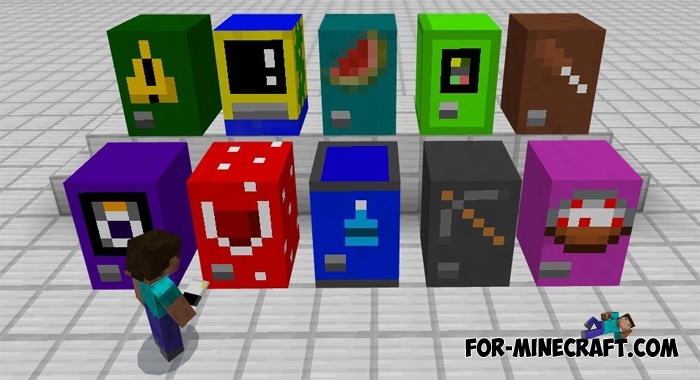 Each machine has a certain color (use dyes to change the color) on which the assortment depends. For example, a yellow machine is designed to check the status of your account as well as depositing funds. These funds can be spent on items in other machines. Open the inventory and find the machine's icon, select and throw at any convenient place to put it. It is better to put the machine at home away from the door. Feel free to buy potions or items. Oh, and before buying items, do not forget to refill the balance (to exchange emeralds for currency).